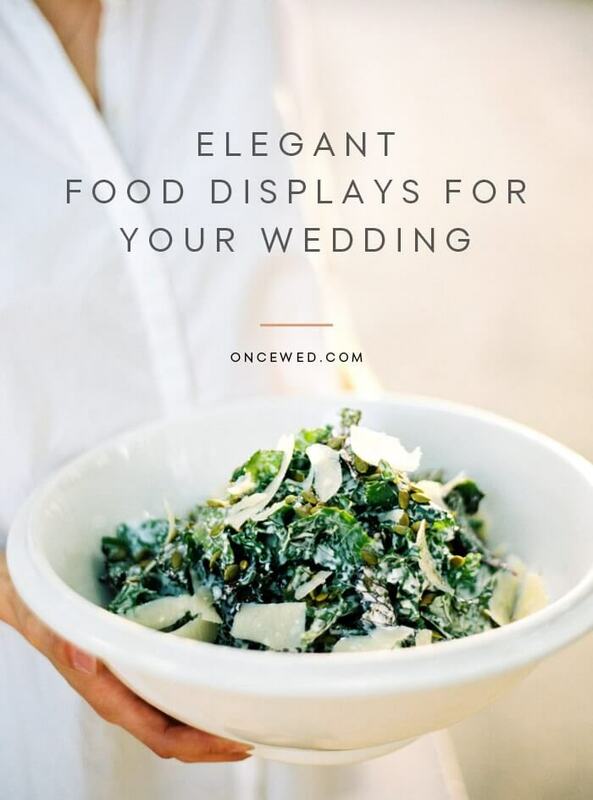 Today we’re talking about a wedding detail that is easy to overdo or overlook – the way food is displayed. Whether you choose a three-course dinner or something more relaxed, there is always an elegant way to present the food you serve. Here are a few ideas we’re loving. Charcuterie, fromage, fruit, all of the above – it’s hard to go wrong. Start with a rustic wooden board; Make & Stow, an artisan company located in Oregon, handcrafts a beautiful charcuterie set that would be the perfect choice. Add cured meats, assorted cheeses, cornichons, dried fruits, fresh berries and artisan crackers. You can make it Mediterranean, Scandinavian or simply farm-to-table. When arranging various food items atop each board, keep in mind size, color and spacing. We take the cocktail bar and cake table for granted, but what about an oyster station? A large-scale spread featuring Tuscan fare? To execute an elegant food bar, find unique rentals instead of standard chafing dishes and linens. Don’t worry about added decoration too much; the food will speak for itself. If you go with a buffet for your main course, think of it as a large food bar. Choose a beautiful table and arrange dishes in an artful way. We love family style dinners. They naturally suit small weddings but can also lend a sense of intimacy to large events. Use your favorite bowls and platters to tie the meal together. Also, remember those boards we talked about? They can be a great addition to family style gatherings. Place boards along the middle of each table for guests to sample and pass around throughout dinner. The phrase “plated dinner” usually implies elegance, but if a plate is haphazardly arranged or just too full, that won’t be the case. Think about it this way – with a food bar or buffet, you can control the initial presentation. Guests will appreciate the display before serving themselves as they please. But with a plated dinner, each plate is a display on it’s own. So talk to your planner, designer or chef about ways to beautifully compose food on a plate. They will have plenty of ideas! Hors d’oevres can be classic or creative. If you choose something entertaining, like sliders and whiskey shots, serve them on a nice tray. An elegant wedding can definitely include pub favorites like french fries or fish and chips – just use high quality paper cones to match the upscale atmosphere you’ve created elsewhere. Click through the slideshow below to see our favorite food displays. Family style is a service choice I hope to see more of, even if it’s just a passed bread or salad bowl. For our couples looking to make their dinner special, family style service immediately makes the meal seem more sacred + intimate. Also enjoyed the tabletop boards suggestion – but maybe just because I’m obsessed with bread, cheese, and charcuterie!